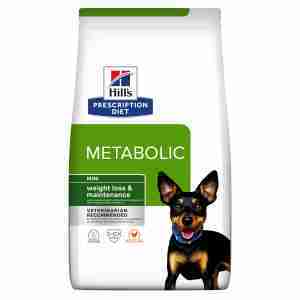 Hill’s Prescription Diet Metabolic Mini is specifically designed for small and miniature dogs and clinically proven to aid in weight loss and maintenance. Metabolic Mini helps healthy digestion and has a specially designed mini kibble with a great taste your dog will love. Weight loss without deprivation – 96% of dogs lost weight in 2 months at home, 90% if dogs completed the weight loss programme. Rosie has been on the mini kibble for a month and done really well on it. Just been to the vet today for a weigh in and her weight is down to 9.4kg from 10kg. I'm really pleased and I think she's happy too as she can run up and down stairs faster to catch her ball. I have only just started giving my Pug this diet controlled food, i am not sure of the amount of kibble to give him but he isn't having any other food to go with it. i will have to wait and seen if he losses a few pounds. The smaller kibble is good for my Cairn terrier. I use it in conjunction with the cans. This was vet recommended and I contacted Hills to make sure I was getting the ratio correct. I weigh carefully and so far it's working well.She has lost 800 grams in just 3 weeks. I have upped her exercise as well.